With all elements of the service area now open, Frontier Park hosted it’s Grand Opening last week. Falling happily on Friday 16th – Children in Need Day 2018 – it was an amazing opportunity for us to show everyone what we’ve got to offer, all while raising money for a very worthwhile cause. The service area of Frontier Park includes a BP petrol station with a SPAR convenience store, along with a Starbucks drive-thru, KFC drive-thru, Greggs drive-thru, Subway, Krispy Kreme concession and a Totally Wicked retail unit. Each of our on-site brands did something special for the day, to encourage donations and show off their products, and the day was an enormous success. 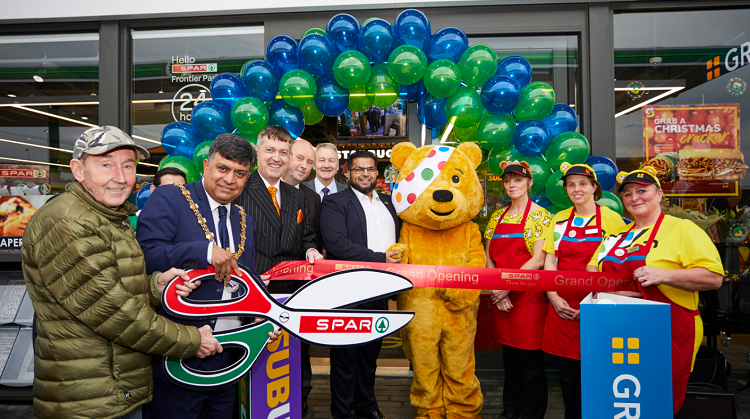 Guests of note included the Mayor and Mayoress of Hyndburn, Cllr Mohammad Ayub and his wife Noreen, who were also joined by record-breaking athlete Ron Hill for the ribbon cutting ceremony. Thanks to our generous customers, we raised £750 for Children in Need, a total that will be matched by EG Group to bring the grand total to £1500.